August 2016 marks the 50th anniversary of the end of the regional conflict known as Confrontation. The impending independence of Malaya and the British colonies on the island of Borneo had been in train since the end of World War II but had been delayed for a number of reasons, one of which was the increasingly hostile opposition of Indonesia. Australia had been a supporter of post-war nationalist and independence movements in Southeast Asia, and as such was a strong supporter of Malaysian independence. A strong, independent and democratic Malaysia was seen as an integral part of Australia’s ‘forward defence’ policy. The new Federation of Malaysia, which included the British protectorates of Sabah and Sarawak on Borneo, and Singapore (though Singapore would later withdraw), was formed on 16 September 1963. The Indonesian government of President Sukarno had already expressed its view that the new federation represented a form of neo-colonialism. Indonesia had recently taken control of West Papua from the Dutch colonial government; however, a disastrous attempt to land soldiers at Kaimana during that brief conflict with the Dutch demonstrated that the Indonesians’ ability to combat a modern, well-trained force was doubtful at best. So, while ganjang Malaysia (crush Malaysia) was a popular expression among Indonesians opposed to the Federation of Malaysia, a conventional conflict to bring about that goal was not a serious option. Instead, Indonesia embarked on a policy of destabilisation, including low-intensity armed operations, defined by Sukarno’s foreign minister, Dr Subandrio, on 20 January 1963 as Konfrontasi (Confrontation). The aims of Confrontation were never clearly expressed. Indeed, Subandrio himself was unable to define what he meant by the term, nor what its implications were. Military action was focused primarily on Borneo where Indonesian forces could easily conduct border incursions into North Borneo from Kalimantan beginning with small, ‘hit and run’ raids in early 1963 and gradually increasing in size and ambition. Later operations in West Malaysia and Singapore, as well as sea denial and interference operations, saw a gradual increase in involvement by the Indonesian Navy over 1964 and 1965. The amorphous nature of Confrontation, which included a mix of diplomatic as well as armed exchanges, makes defining its actual beginning difficult; however, the Brunei Rebellion of December 1962 may be seen as the start of hostilities. An Indonesian trained guerrilla force launched its rebellion without any intention of deposing the Sultan, but specifically in rejection of the impending Federation of Malaysia. it in their respective Reports of Proceedings. Their deployment continued uninterrupted; conducting fleet exercises in Philippine waters and a diplomatic visit to South Vietnam before returning to Australia in mid-February 1963. HMAS Curlew on patrol during Confrontation. In January 1963 RAN vessels began patrol duties in the territorial waters off North Borneo; however, counter-attacks into Indonesian territory were not sanctioned. This severely limited the scope of naval operations as the Indonesian government claimed territorial waters to a distance of 12 miles from the coastline, which FESR units were ordered not to violate. While there was little practical effect on FESR deployments through 1963, there was, however, an awareness of increasing tensions with Indonesia. As Captain John Stevenson, ADC, RAN, commanding officer of HMAS Vendetta (II) reported when the frigate encountered an Indonesian submarine in the South China Sea, the submarine ‘…looked sufficiently sinister to impress my young ship’s company with the seriousness of the task in front of them'. 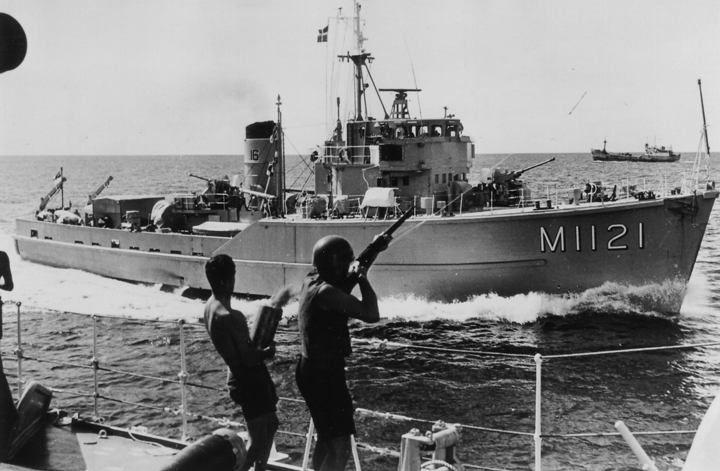 Indonesian forces stepped up cross-border operations in 1964, and, that April, while participating in Exercise HIGH UP in the Singapore area, HMA Ships Parramatta (III) and Yarra (III) were assigned night patrol duties off the Malaysian coast with the task of intercepting intruding Indonesian submarines and fast patrol boats. They made no contacts. At the same time the Australian government agreed to a Malaysian request for the deployment of four coastal minesweepers. On 1 May 1964 HMA Ships Gull and Hawk sailed from Sydney for their first respective FESR deployments and began patrol duties off the north coast of Borneo on 9 June. They were joined on station by their sister ships HMA Ships Curlew and Snipe in July. Their patrols were centred on Tawau, on the border between Sabah and Kalimantan, where a small fleet of coastal minesweepers and patrol vessels, supported by a destroyer or frigate, known somewhat aspirationally as the Tawau Assault Group, were based. The Ton class mine countermeasures (MCM) vessels would have the greatest direct RAN involvement in Confrontation. In April 1964, in addition to the commitment of the MCM, the government also agreed to the deployment of 7 Field Squadron, Royal Australian Engineers, for duties in Borneo. The squadron was transported to Jesselton (Kota Kinabalu) in Sabah in May/June by the recently converted fast troop carrier, HMAS Sydney (III), escorted part of the way by Parramatta and Yarra. HMAS Hawk’s gun crew at the ready as the ship intercepts a vessel off Borneo. The threat to the Malayan peninsula increased in August and September 1964 when Indonesian forces began making incursions across the Malacca Strait by both sea and air. Between 17 August 1964 and 29 March 1965 there were 39 landings, attempted landings or reconnaissances against peninsula Malaysia and Singapore by Indonesian forces. In response, naval patrols in the Malacca and Singapore straits were intensified, and the very tight rules of engagement that Commonwealth naval units had been operating under were loosened; however, limiting the potential for escalation remained the overriding concern. As is typically the case, patrols were long and tedious affairs punctuated by instances of intense action. On 6 December 1964 HMAS Teal, patrolling the Singapore Strait, aimed light machine-gun fire across the bow of an unlit vessel attempting to avoid interception. The vessel eventually stopped and three Indonesian soldiers were arrested. A week later, Teal encountered two sampans in Singaporean waters. The two vessels separated and one escaped into Indonesian waters. The other opened fire upon Teal, which returned fire killing three of the seven crewmen aboard with the vessel surrendering. Explosives, weapons and other equipment were found on board. Teal’s Commanding Officer, Lieutenant Keith Murray, RAN, was awarded the Distinguished Service Cross for his coolness and judgement during these incidents, the only award for gallantry made to the RAN during Confrontation. On 23 February 1965 Teal arrested a boatload of nine uniformed and heavily armed Indonesians, all wearing the insignia of the Malay National Army. territorial waters. In this instance, Hawk did not retaliate. The following month, however, retaliate she did. Patrolling off Tawau near Nunukan Island, Hawk had embarked a detachment of four Ghurkhas who were to man two assault boats as observation posts during night patrols. On 7 April, the Ghurkhas came under Indonesian mortar fire from Nunukan Island. The Indonesian fire ceased when Hawk fired warning shots from her 40mm Bofors into the sea. The following evening, Hawk and the Ghurkhas again came under Indonesian mortar fire. On this occasion, Hawk, in concert with shore-based Malaysian artillery, returned fire for effect, engaging Indonesian targets with 30 rounds from her Bofors. The mortar fire quickly ceased. The MCM maintained patrol operations, interrogated suspicious vessels, and made arrests throughout Confrontation. It was long, hard, and tedious work. During a five-month period on patrol in 1964-65, HMAS Ibis spent 87 of 100 days at sea. The MCM proved to be a worthy gunboat with a useful all round capability; however the fact remains that they were out-gunned by nearly every Indonesian warship in the region. The larger ships on the station, the destroyers and frigates, likewise spent time patrolling the Malacca and Singapore straits interspersed with periods of duty as the Tawau guardship, and escorting RN troop and aircraft carriers, all while maintaining a program of exercises and diplomatic port visits. Patrol duties were complicated by the large amount of commercial traffic in the straits. At one point in April 1965, Yarra had 182 fishing vessels visible on her radar plot. Service as the Tawau guardship offered greater opportunities for direct contact with Indonesian forces for the larger units. 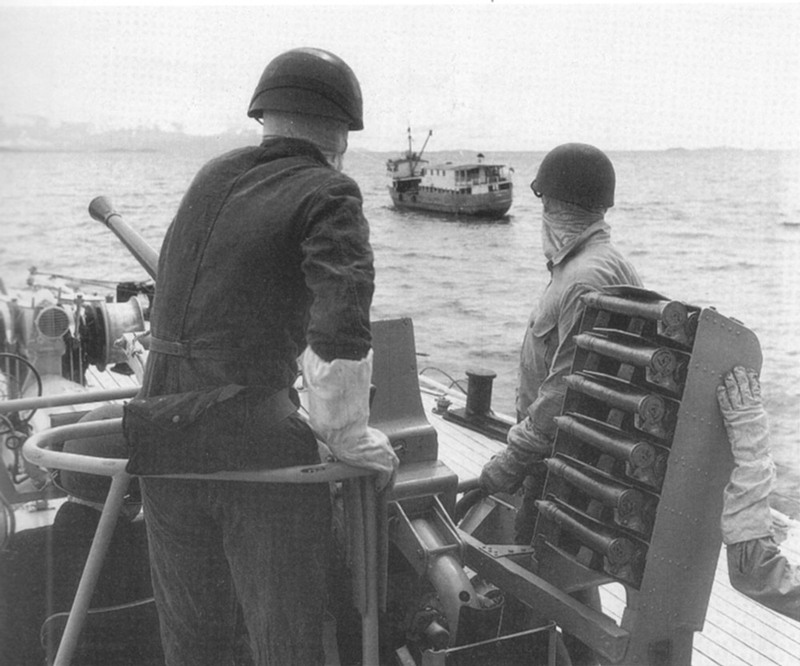 RAN vessels conducted occasional naval gunfire support missions against targets ashore; and, while no engagements occurred, Indonesian vessels were occasionally sighted across the line of demarcation. On the night of 30 September/1 October 1965, a communist inspired coup attempt occurred in Indonesia. The coup was a failure but was followed by widespread civil unrest and violence. It proved a turning point for Confrontation, which thereafter declined in intensity. On 13 August 1966 a peace agreement was signed in Bangkok between Indonesia and Malaysia bringing Confrontation to an end. ↑Stephan Frühling (ed), 'A History of Australian Strategic Policy Since 1945', Defence Publishing Service, Canberra, 2009, pp. 277-295. ↑Matthew M Aid and Cees Wiebes (eds), 'Secrets of Signals Intelligence During the Cold War and Beyond', Frank Cass Publishers, New York, 2001, p. 304. ↑Peter Dennis and Jeffrey Grey, 'Emergency and Confrontation: Australian Military Operations in Malaya and Borneo 1950-1966', Allen & Unwin, Sydney, 1996, pp. 175-184. ↑Jeffrey Grey, 'Up Top: The Royal Australian Navy and Southeast Asian Conflicts 1955-1972', Allen & Unwin, Sydney, 1998, pp. 46-50. ↑HMAS Vendetta Report of Proceedings, July 1963. ↑Dennis & Grey, 'Emergency and Confrontation', p. 228. ↑Grey, 'Up Top', pp. 58-59. ↑Experience of small boat work led to the introduction of a patrol boat capability into the RAN, through the Attack class in the late 1960s. ↑HMAS Yarra Report of Proceedings, April 1965.